All families should have at least one family game night a week, if not more. When the weather is dreary, board games give you a great excuse to curl up and stay warm inside. However, now that spring is here and summer is on the horizon, you should move game night outside! 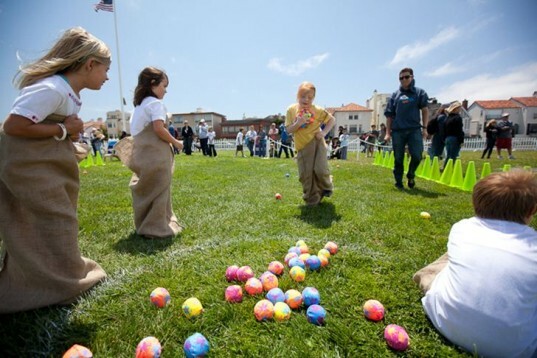 Outdoor lawn games not only keep kids active and healthy, but work their brains, teach cooperation and are fun to boot. 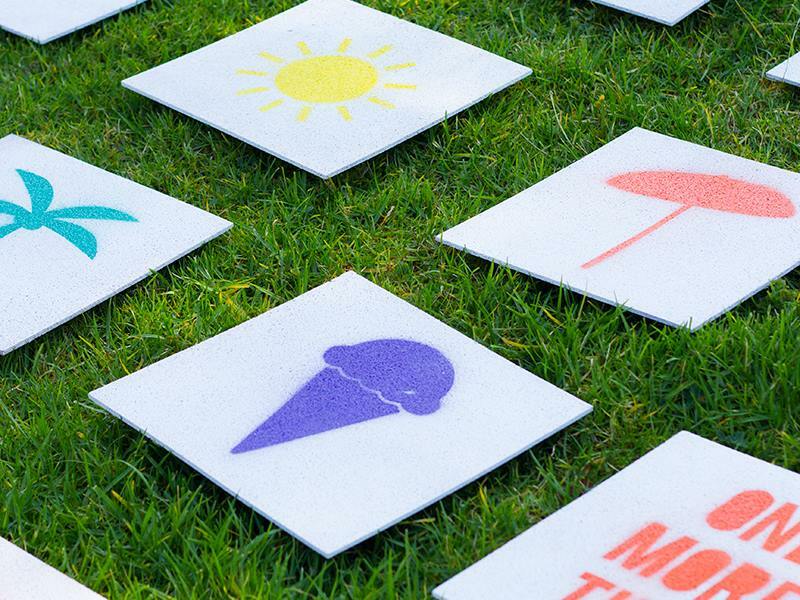 Keep reading to see 10 amazingly fun DIY yard games that the whole family (and all your friends) will enjoy. 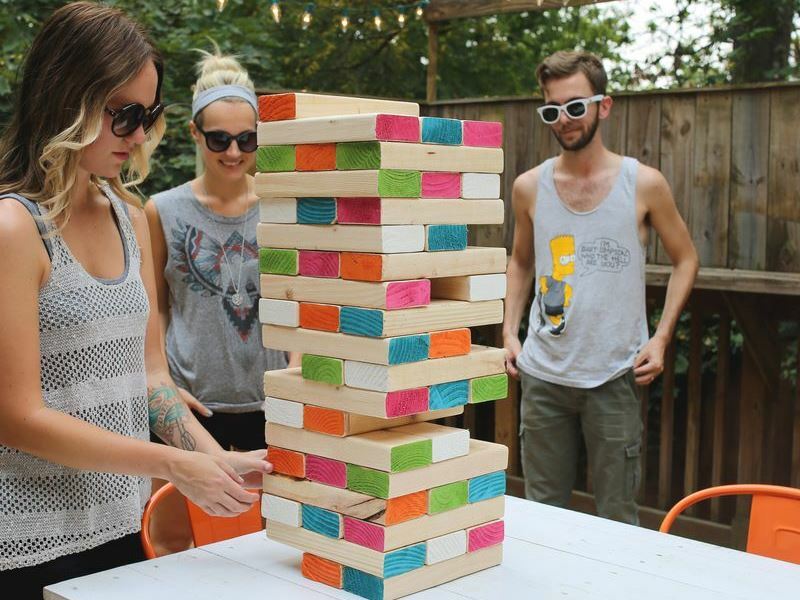 If you can get your hands on some 2×4 boards, sandpaper and colorful paint, you can make your very own gigantic Jenga game, sure to please adults and kids alike. 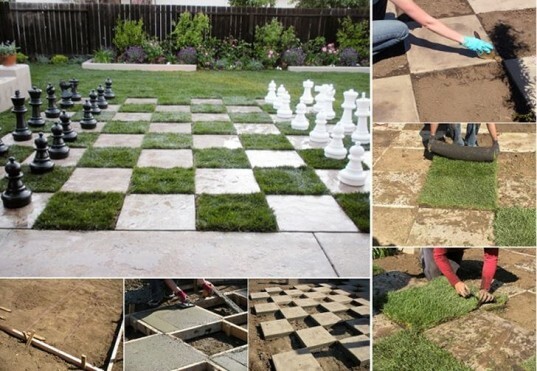 This attractive patio design not only adds a modern look to your yard space but it doubles as a huge chess game board. While on the more expensive DIY side, this patio plan can be used for years to encourage your family to play together. LEGO bricks and ice bowling balls on a hot summer day is one of the most kid-perfect activities we’ve ever heard of. The ice balls cool kids off and are super fun. Plus this is a game that’s totally repurposed with minimal clean-up. Once done, the balls melt away and LEGOs just get tossed back into the bin. 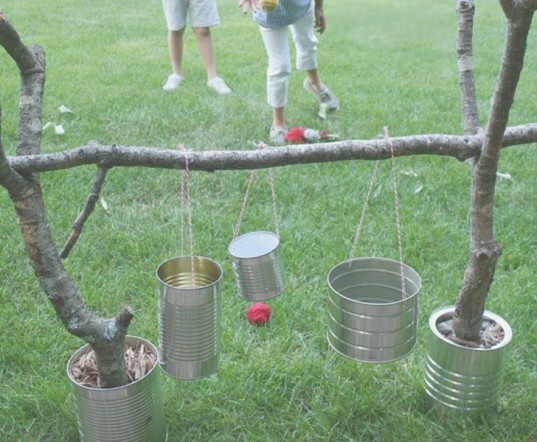 While there aren’t any instructions to be had regarding this cool looking project, it seems easy enough to duplicate, as long as you have some recycled cans, discarded branches and string. Use your imagination, then hand your kids some rocks, balls or beanbags and have them toss til their heart’s content. What do you get when you combine recycled pool noodles and blasts of water? A whole lot of cooling (and active) fun for kids on a hot summer day. These pool noodles can shoot water over 30 feet and aren’t too hard or expensive to make. 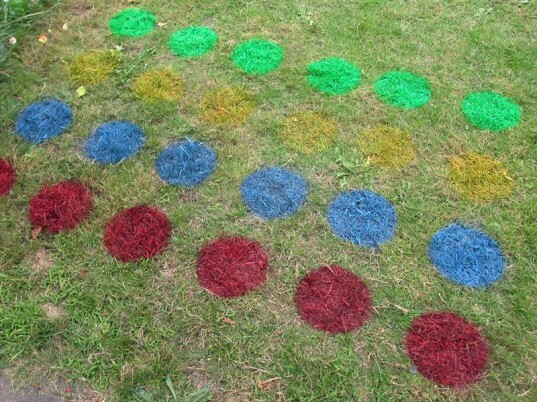 If you’ve got a patch of lawn that you’re planning on growing out, then Twister in the grass is a fun game option. If your lawn is in tip-top shape and you’re reluctant to paint it, try placing an old sheet on the lawn and paint that instead. 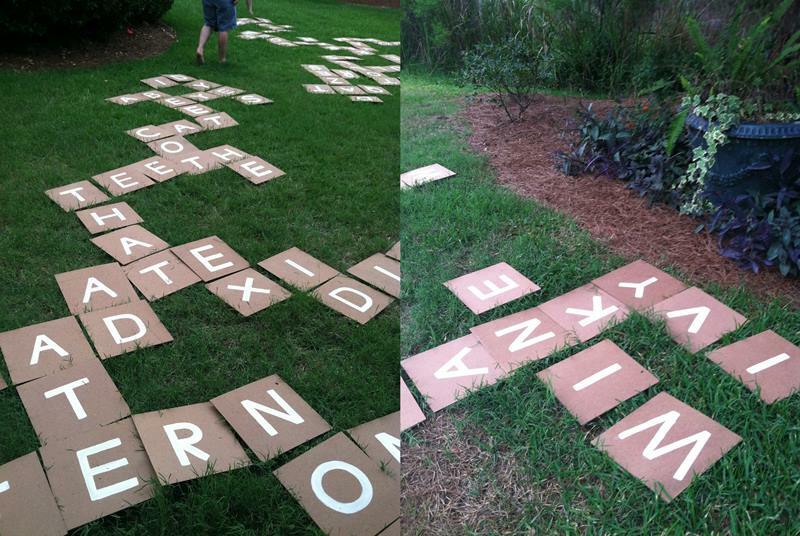 No matter if your family likes Bananagrams or Scrabble better, these gigantic 12″x12″ letters will cause quit a stir, and a lot of fun in the yard. 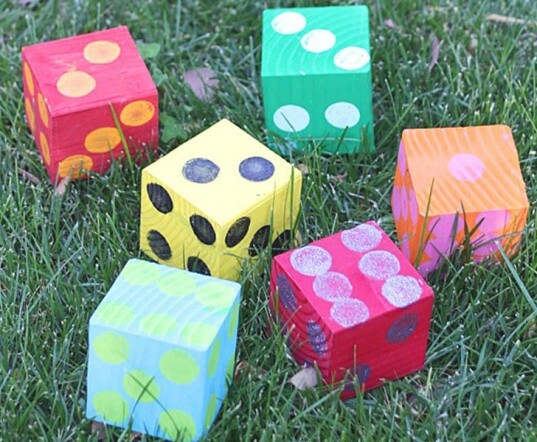 These huge yard dice are easy to make, and very economical (around $5.00 to make! ), plus they don’t just have to be used for Yahtzee. There are tons of other yard games your family could play involving large dice. I’ve never met a young kid who didn’t love, love, love matching games, and this one brings on some BIG time fun. Made with basic cork tiles, paint and just a few other materials, this is an easy as pie yard game to create. Especially since you can download FREE Printable Stencils (pdf) that include 12 symbols, one bonus turn tile and a shape for stenciling the back of the tiles. 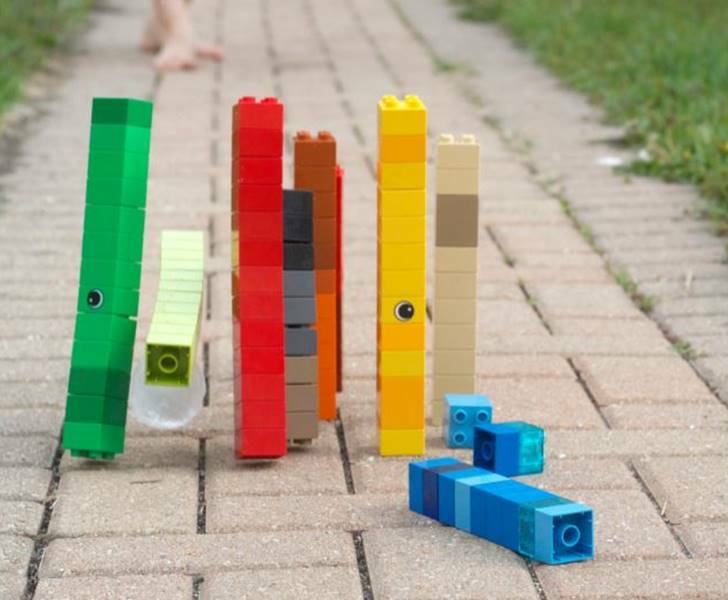 Encourage Your Kids to Create Yard Games! The best source of games in the yard is your own child. 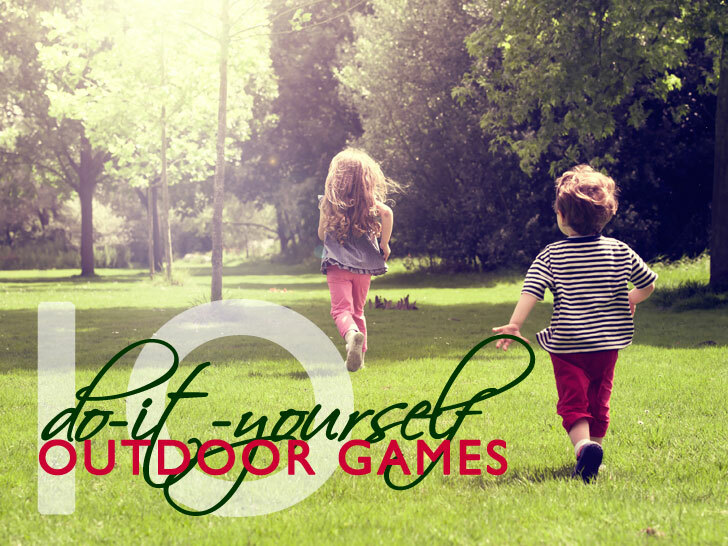 For years now, CLIF Kid has been running a super cool contest annually that encourages kids to come up with their very own homemade, active, outdoor games, and many children have risen to this challenge. The kids involved with the CLIF Kid contest have invented countless action-packed games using their imagination and a few materials. Your kid can too. For inspiration, visit the CLIF Kid Outdoor Game website (with your child) and see a line-up of some of their best outdoor games. RELATED | 5 Green Family Night Activities For Bonding and Fun! If you can get your hands on some 2x4 boards, sandpaper and colorful paint, you can make your very own gigantic Jenga game, sure to please adults and kids alike. LEGO bricks and ice bowling balls on a hot summer day is one of the most kid-perfect activities we've ever heard of. The ice balls cool kids off and are super fun. Plus this is a game that's totally repurposed with minimal clean-up. Once done, the balls melt away and LEGOs just get tossed back into the bin. While there aren't any instructions to be had regarding this cool looking project, it seems easy enough to duplicate, as long as you have some recycled cans, discarded branches and string. Use your imagination, then hand your kids some rocks, balls or beanbags and have them toss til their heart's content. What do you get when you combine recycled pool noodles and blasts of water? A whole lot of cooling (and active) fun for kids on a hot summer day. 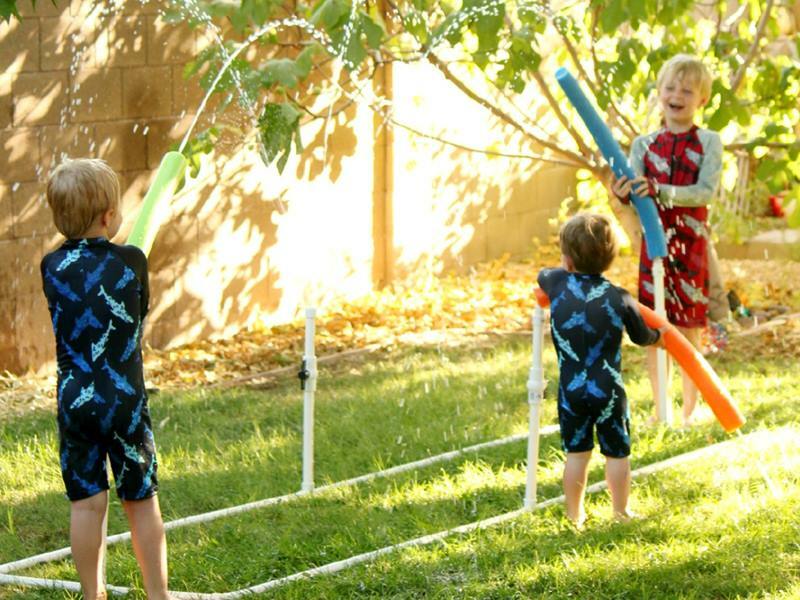 These pool noodles can shoot water over 30 feet and aren't too hard or expensive to make. 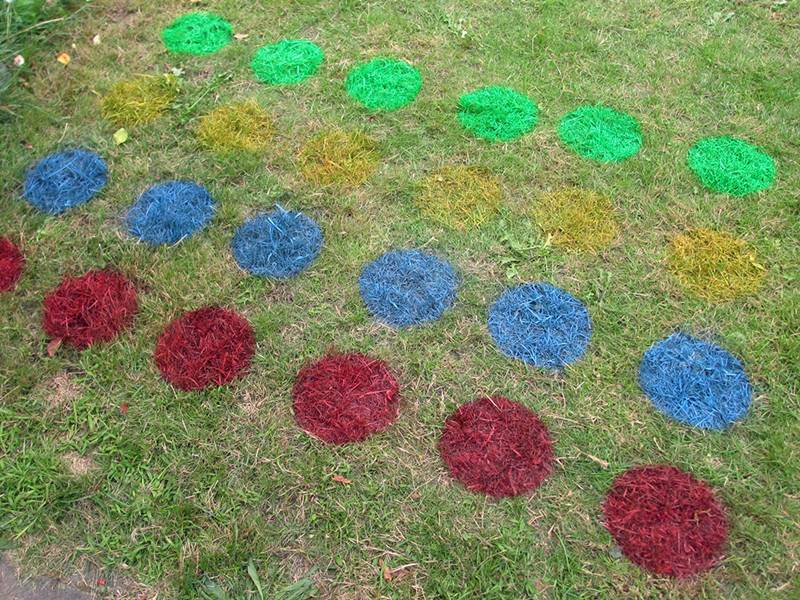 If you've got a patch of lawn that you're planning on growing out, then Twister in the grass is a fun game option. If your lawn is in tip-top shape and you're reluctant to paint it, try placing an old sheet on the lawn and paint that instead. No matter if your family likes Bananagrams or Scrabble better, these gigantic 12"x12" letters will cause quit a stir, and a lot of fun in the yard. These huge yard dice are easy to make, and very economical (around $5.00 to make! ), plus they don't just have to be used for Yahtzee. There are tons of other yard games your family could play involving large dice. I've never met a young kid who didn't love, love, love matching games, and this one brings on some BIG time fun. Made with basic cork tiles, paint and just a few other materials, this is an easy as pie yard game to create. Especially since you can download FREE Printable Stencils (pdf) that include 12 symbols, one bonus turn tile and a shape for stenciling the back of the tiles.